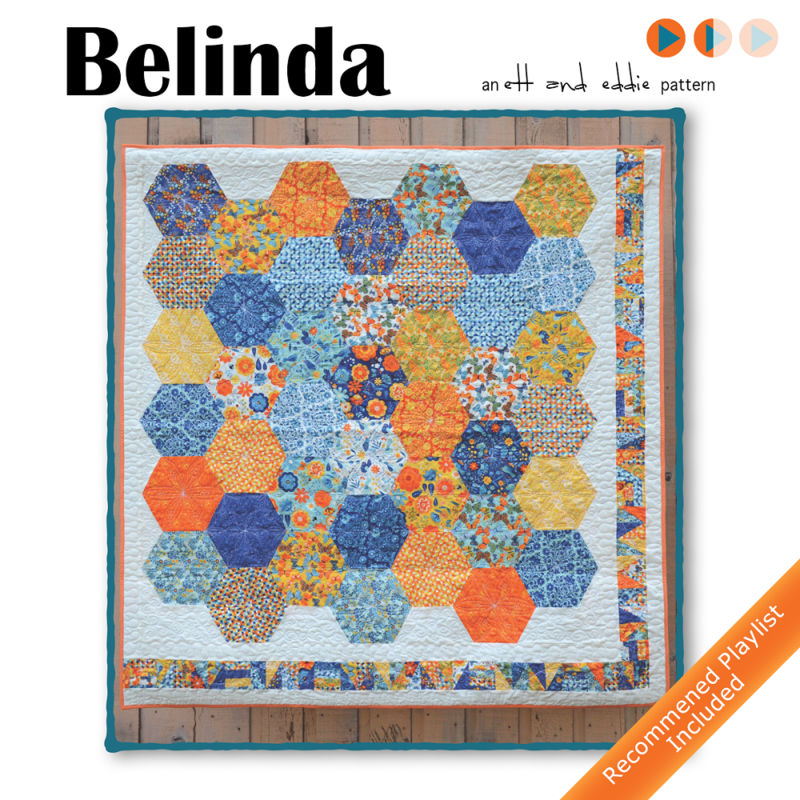 We’re coming up on a year since we launched our digital quilt pattern line, and I wanted to spend some time revisiting one of my favorites, the Belinda giant hexagon quilt. This pattern was originally designed as a layer cake quilt, using all 42 10″ squares to make the giant hexagons. What I love about it, though, is that you’re not tied to a layer cake to make the quilt; Lynn and I have both recently used fat quarters and random fabric scraps to make different versions of it. In mine, I used scraps from my stash to make pieced hexagons, so I’ll spend the next few weeks explaining that process, from fabric selection to designing the pieced hexagons. After buying the quilt pattern, the next step is figuring our fabric! I started with an inspiration fat quarter, seen as the background below. When I was making this quilt, I knew the person I was giving it to specifically wanted yellow and gray in it. I wanted to liven up that palette a bit with some additional colors, so I pulled in colors from my inspiration fat quarter: peachy fabrics and purple / lavender fabrics. In addition to fat quarters and yardage in my coordinating fabrics, I also pulled in scraps from my stash in 3 1/2″, 5″, and random strings or strips of fabric to make pieced hexagons. Once I had my fabrics pulled together, I cut my inspiration fat quarter into the right size hexagons (the templates are included in the digital quilt pattern, or you can use a 60 degree ruler to do it using the directions in the pattern). A note about fabric value: because of the way Belinda is put together, you can get away with a lot of medium values in the center; that means the fabrics when viewed with a gray scale filter on a digital picture using your camera, or even a red filter, don’t have all that much contrast. Now, that doesn’t mean you can’t have high contrast with dark and light values thrown in; my particular hexagon quilt was meant for a baby’s nursery with soft colors so high value contrast would have not looked right in the room. Next week I’ll show two ways to make pieced hexagons!